"Hello there. I lived in London 9 years ago and used to dine at Govinda's near Tottenham Court Road regularly. I still crave the amazing quiche they used to serve. I wondered if you would be able to let me know the recipe, or some of it so I can attempt to make it myself. Many thanks, S."
Dear S: Here's my eggless quiche recipe. Obviously you can put in whatever vegies you like. A quiche is an open faced tart with a savoury filling and is the perfect luncheon or supper dish accompanied by a green salad and French bread. It also makes a good first course for dinner. Quiche lends itself to advance preparation; the crust or base of the quiche should be cooked beforehand. 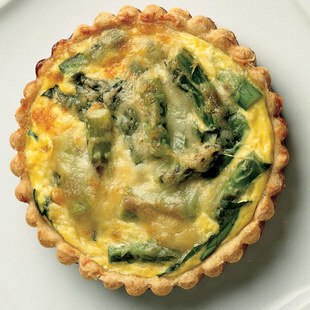 A cold quiche is great for picnic fare or makes a quick, satisfying snack. YIELD: one 20 cm (8-inch) quiche. Combine the butter and flour, rubbing well until it reaches a coarse meal consistency. Add the water and parmesan cheese to the mixture and mix to form a firm pastry . Press the mixture into a buttered 20 cm (8-inch) quiche or flan tin, being careful that the crust mixture is evenly distributed throughout the tin. Bake the quiche crust in a hot oven 200°C/390°F until light golden brown. Allow to cool. Combine the sour cream, softened cream cheese, tomato paste, cornflour, salt, pepper, 1 cup cheese, herbs, and spices and mix well. Add the asparagus. Spoon the mixture into the cooled quiche crust, smooth out, press the slices of tomato on top, sprinkle with the remaining cheese, and bake in a preheated oven set on 190°C/375°F for about 20 minutes or until the filling is set and the top is golden. Allow to cool before serving.